SueLyn Smith Athey of Damascus, Maryland, passed away on August 6, 2018 after a long battle with cancer. She was the beloved wife of William Athey to whom she was married for 19 years. SueLyn was born May 8, 1958 in Johnson City, New York and grew up in Rockville, Maryland then Damascus, Maryland following her marriage. She is survived by her two sisters, Joanne Smith (Ty Burtner), Kim Breuninger (Robert), niece ShariAnne McDermott (Alex), grandniece Avery McDermott, Francis Athey, Raymond Athey, Deborah Shelton (Brian), and Michael Athey. SueLyn was predeceased by her father and mother, John W. and Anne P. Smith, her nephew Christopher John Breuninger and father-in-law BillyJoe Athey. 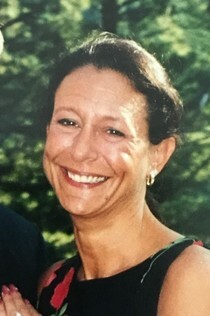 SueLyn graduate from Thomas S. Wootton High School in 1976 and the University of Maryland in 1980 where she earned a degree in Criminal Justice. She attended Law School at Western New England College where she received her Juris Doctor degree. When not studying she could be found playing pool or darts, at which she excelled, much to the chagrin of unsuspecting players. Following law school she worked for Reed Smith LLP specializing in Real Estate law and Mergers and Acquisitions. SueLyn was a great cook, loved to read, travel and spend time with her husband and their dogs. She was an avid supporter of rescue dogs, often having up to four at any given time. She often said that she she didn’t rescue them, they rescued her. SueLyn loved walking the beach and collecting shells in Marco Island, Florida, riding her zero-turn lawn mower and sitting at her pool. These were followed closely by long shopping days with her best friend, Joanne. Funeral Services will be held at 11:00 AM at St. Bartholomew's Episcopal Church in Laytonsville, Maryland on August 13, 2018. There will be a visitation from 10:00AM - 10:50AM. In lieu of flowers, donations may be made to the Lucky Dog Animal Rescue or St. Bartholomew’s Episcopal Church. 5159 Lee Highway Arlington, Virginia 22207.